This evening my 10 year old son made this recipe for us. It is not difficult and results in donuts with a crispy outside and a lovely soft interior. I did help him with the frying of the donuts, as I didn’t want him to get hurt by hot grease. 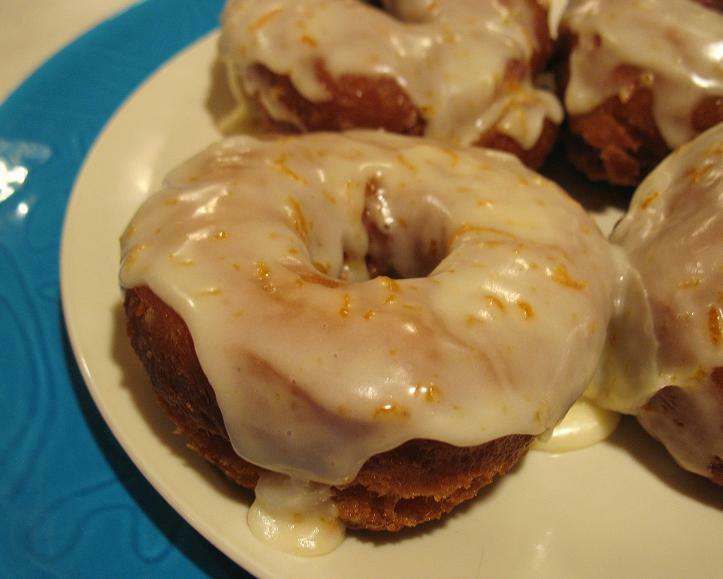 If you’ve never made home made donuts, give this recipe a try. You may be surprised at how easy it is! Dissolve yeast and in warm water in a large bowl. Stir and let sit for 5 minutes. If you are making your own ‘buttermilk’, mix milk and vinegar and let it sit 5 minutes also. Into a bowl measure 2 cups flour and mix with baking powder, sugar and salt. Add buttermilk, yeast mixture, and melted shortening and mix well. Add enough remaining flour to make a soft dough. Fill a medium sized deep pot about 2-3 inches deep with oil. I chose a pot that would just fit 3 donuts at once, so I didn’t have to use so much oil. Heat oil over medium heat to 325 or 350 degrees. If you don’t have a thermometer, let oil heat 3-4 minutes and trial the temperature by frying one donut. One side of the donut should get a nice medium brown in about a minute, at which point you should carefully flip the donut and cook for another minute on the other side. If the donut gets dark brown before the time is up, the oil is too hot, and you should turn the burner down. The oil will get hotter the longer it heats. After your first batch, you’ll need to turn the burner a little cooler so that the donuts don’t cook too fast, which results in dark outsides and doughy centers. If needed, you can also add a bit more oil to cool the temperature down even more. However don’t let the oil cool too much or the donuts will cook too slowly and be overly greasy. Cook donuts about 2 minutes each or until lightly golden in color, turning once. Drain well on paper towels. Combine 2 1/2 cups powdered sugar with 1/4 cup milk and 1 teaspoon orange zest. Stir until smooth. using a knife, spread glaze over the tops of donuts while still hot, allowing extra glaze to drip off. Cool or serve warm. Or do like I did and make a double batch, half to eat warm and half to eat later. Enjoy! Long time reader of Owlhaven, first time commenter! This looks delicious! But I wanted to show you something actually! My son showed me this article that a friend of his wrote (I think he’s maybe 18 or 19 years old) and I thought it just gave some really interesting insight into the minds of kids these days and ended with a very poignant bit of parenting advice from the youth. I just felt that it was a great way to start off 2009 from a different view and that maybe you’d want to share the link with your readers. No pressure at all, just thought it was something that you and your adoring fans may like! So yeah, please keep up the good work and have an incredible new year! These look delish! We’ll be trying this recipe. When we’re in the mood for donuts, I cheat. I use (store brand) canned biscuits and cut holes out of the centers – then fry both. We coat them in powdered sugar mixed with a little cinnamon. Or, I just cut them in half before frying and call them beignets (easier than using the Cafe Du Monde mix)! Thanks for the recipe. I LOVE DONUTS!!!!! I’ll be making these very soon. Those look delicious, I will definitely have to try those sometime! These look and sound great! Is this a recipe that will find it’s way into your cookbook? Nancy, Yes, these will be in the book! OMG-ness, I’m such a loser! You already answered my question. Duh. Sorry! I must have a case of the “Mondays”. This looks so yummy! I will have to give it a try; thanks for sharing. And I’m impressed at your 10-year-old chef! Big pats on the back to him. I’ve never fried anything, but I think I will have to give this a whirl this weekend. Thanks for sharing. I can’t wait for your cookbook to come out. Yummy! Can’t wait to set my own 10-year-old to work on these. Our family will thoroughly enjoy these, Mary. Thanks for including the recipe. Mary, they were YUMMY! The kids kept asking for more. Great recipe. I have been looking for a good donut recipe. Thanks for this! I’m going to try it this afternoon with my kids. They are SO excited. I really appreciate the clear instructions as well. Wow! I just read that you have 10 kids. My hat off to you! Amazing! And still you have time to make AND share the donut recipe! In those olden days when I was a kid (those late 70’s, early 80’s when we had pens but not computers), we had a donut maker that was similar to a waffle maker; pour in the batter, close the lid, and let them cook. I wonder if they still make those? I think they’d be a little healthier than the fried kind, and they automatically made the hole in the center without having to cut them out, etc. We surely did love making them. Except we couldn’t do “donut holes” since the machine did it for us, but still, nobody else we knew made donuts.